Tony Bushala, FFFF founder, site administrator, activist from 2008-2013. It appears as if the depot elevator project is grinding to a conclusion: the elevator foundations and steel are finally done and the traction elevators are almost complete. Are congratulations in order? Not quite, although I suspect there will be a victory celebration and ribbon cutting and back-pats all around when the City Council takes its first expensive elevator ride. A construction sequence that should have taken perhaps seven months has dragged on for two years. That’s right – two years. No one in charge seems to have offered any explanation, probably because no one in authority has ever asked for any. As I noted in the spring of 2017, the request for more money was shrouded in double talk and obscurantism. Somebody was hiding something. Over the past two years as I have driven by the site it was more likely that I saw no one working as when I did. So what were all those people who were being paid, and well paid, to oversee this fiasco doing? Who knows? 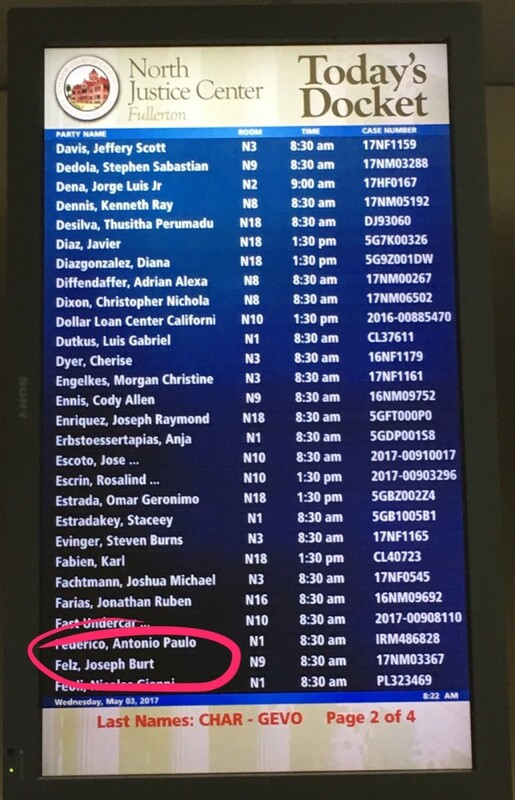 Have delay claim change orders ever been processed? Have they been rejected? Is a lawsuit coming or is it just going to end in a feeding frenzy on a complicit public agency? PRA requests may shed light on this disaster, if in fact they are not ignored by the city’s lawyer. Don Hoppe, our former City Engineer has disappeared into a well-pensioned retirement. His replacement, a professionally unqualified bureaucrat will take no heat for this embarrassment. It’s no-fault government where the taxpayer foots the bill. 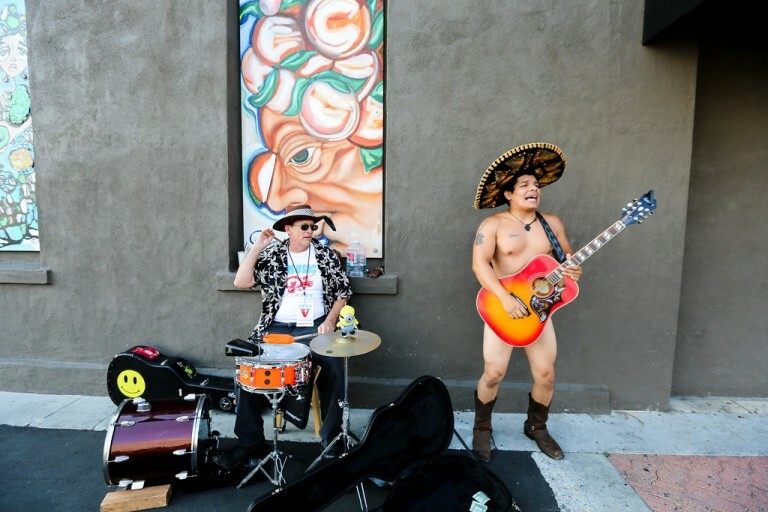 Today is the Fullerton Day of Music, where over 150 music acts will play at venues all over town. Here’s the list. Now chill out and go listen to some tunes. Here’s the final (for now) installment of the series by our Friend “Fullerton Engineer” documenting the sad history of the project to add a couple of elevators to the existing tower/bridge structure at the Depot. Remarkably, none of our elected representatives seems the least bit curious about the downward trajectory of this project, or the ultimate tap into our Facility Capital Repair Fund, a fund that was never intended to pay for new construction, particularly for projects never needed in the first place. The best way of avoiding embarrassing information is not to ask embarrassing questions. It’s not their money. It took over five years, but the astonishingly high cost of an elevator addition project at the Fullerton train station finally hit Fullerton taxpayers directly in 2017. The project that the public never asked for and doesn’t need was initiated based not on necessisity, but on the availability of money from Sacramento; and later, OCTA came to the funding rescue. But the delays piled up – year after year, and OCTA would no longer pay the bill. So in March, the City Engineer, Don Hoppe, came hat in hand and asked the Fullerton taxpayers for money. Lots of it. Here’s the staff report. Notice how the various and diverse issues are all thrown together into a single sum – $600,000. We see added cost for the railroad flagging for some unexplained reason; the curiosity of “unforeseen” utilities on a well-developed site; an unknown amount to pay for the escalated cost of the elevator subcontractor; and finally, an unspecified amount to cover “additional assistant (sic) in contract administration” a nebulous term, but a category clearly meant to cover the ongoing cost of someone in the Public Works department. The final item is particularly ironic given the amounts already contracted with private companies for construction support and management on this very small project. The simple fact that these items are lumped together can only be explained by an attempt to obfuscate the nature and trues costs of the ongoing delay. And those delay costs are increasing even now, as the project seems to have stalled again. 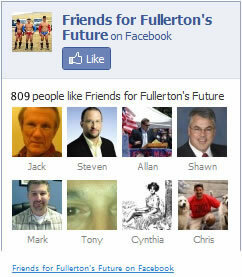 The KFI radio jocks love stirring things up here in Fullerton. Whether its the 2009 tax revolt, the 2011 teachers’ union protest or the 2012 Fullerton recall, they just can’t seem to avoid our little town and its parade of terrible politicians. 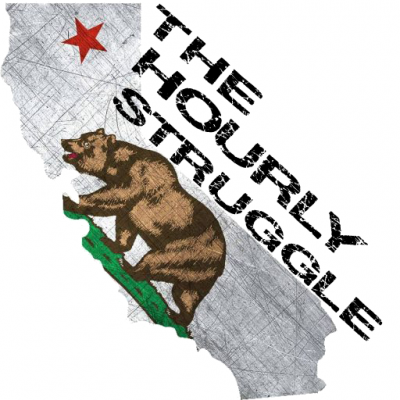 Here’s a clip of KFI’s John and Ken expanding upon The Hourly Struggle’s recent interview with state senator Josh Newman. The radio hosts also took the opportunity to announce that they are coming to Fullerton this week, gathering signatures to recall Newman. 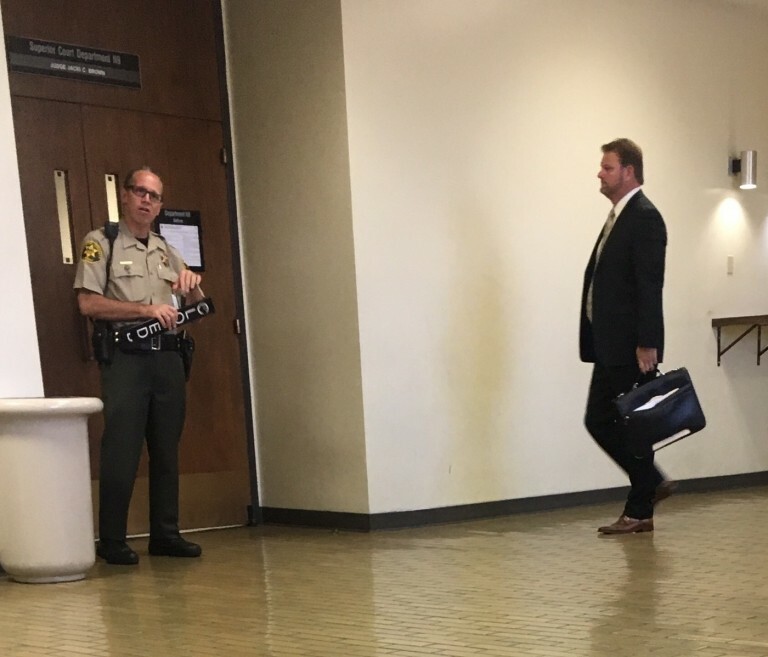 The effort to recall State Senator Josh Newman is officially on! This Thursday we’re going to broadcast live in Fullerton, and we need you to come by and sign the recall petition. Carl DeMaio, who hosts on our San Diego sister station KOGO-AM, has worked hard to put all of this together. He’ll be there doing his show along side us from 3-6pm. We’re also in need of volunteers to collect the signatures, you can click here to sign up for a date that works for you. Be sure to come by, sign a petition and say hello to your favorite FFFFers. In following the trajectory of the new elevator project at the Fullerton train station I have described a project that the public neither wanted nor needed, that had its genesis in the simple availability of “free money” way back in 2011 – six long years ago. Although the design contract was let in 2013, the project was not bid until 2015 when the low bid came in 22% higher than anticipated. The construction contract was awarded anyway. With numerous ancillary “management” contracts, the project budget had grown to $4,000,000. By 2017 that figure had ballooned to an astonishing $4,600,000. And yet construction didn’t start until February, 2016 and when it did it was only for some minor ADA toilet room modifications adjacent to the AMTRAK ticket office. You can see in the project billing submitted by Woodcliff Corporation, the contractor, a few items related to bonds, mobilization and the bathroom work in February 2016 – a year after the contract bid. Nothing was billed against the elevator items at all, except for crediting the structural steel shop drawings for $55,000. Over 14 months later the structural steel has not been erected. In fact, the foundations for the steel structure haven’t even been built, as the site sits empty with minor demolition having taken place and some lighting conduit rerouted. If any delay claims have been submitted by Woodcliff, those documents have not been shared, although delay claims are certainly coming, and escalation costs are already starting to accrue, although we don’t know how much because the costs were intentionally lumped together with other completely unrelated items in the March 2017 staff report. As I noted in an earlier post the cause of all these delays is not known by the public because the Public Works staff doesn’t want the public to know that things have obviously gone wrong, very wrong; and, that the inexplicable and unexplained delays have finally cost the taxpayers of Fullerton directly. The money is no longer free. This should be quite an event, as Ferguson has lobbed a series of public critiques at Senator Newman for his involvement as a deciding vote in the $5.2 billion California car tax last month. 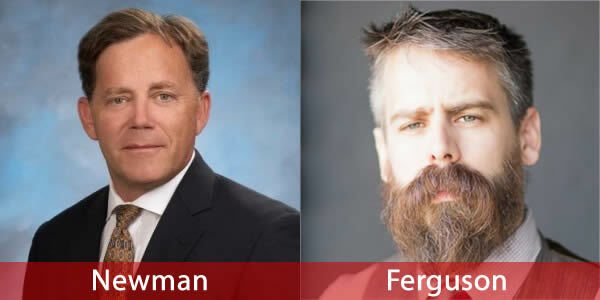 My guess is that Ferguson will not be throwing any softballs towards Newman. The podcast will be available on The Hourly Struggle Facebook page at 7:00 PM (1900Hours) on Friday. Replays will be available on iTunes and Google Play. They say the wheels of justice turn slowly. They would be right. 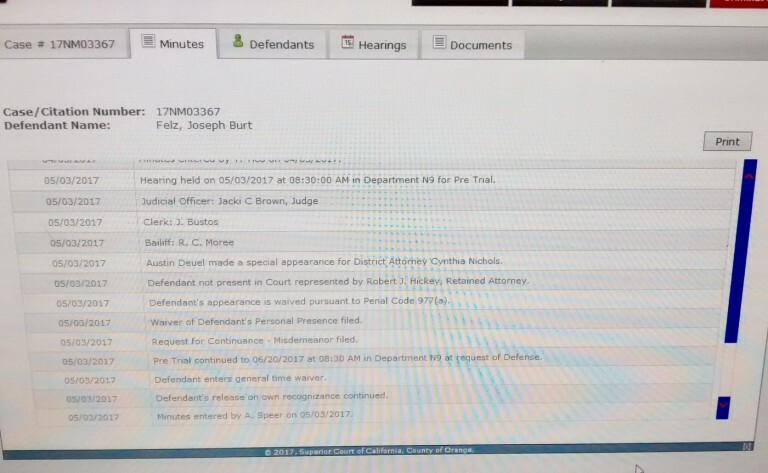 Today a pre-trail hearing for Joe “Burt” Felz’ DUI caper was on the docket over at North Court. Joe sent his attorney to handle the matter, who promptly asked the court to continue the case to a future date. That date is June 20. There isn’t much else to talk about, so enjoy a little photo fun courtesy of the FFFF courtroom reporting team. Burt’s attorney, ready to represent his many upstanding clients. Lots of activity, little progress. 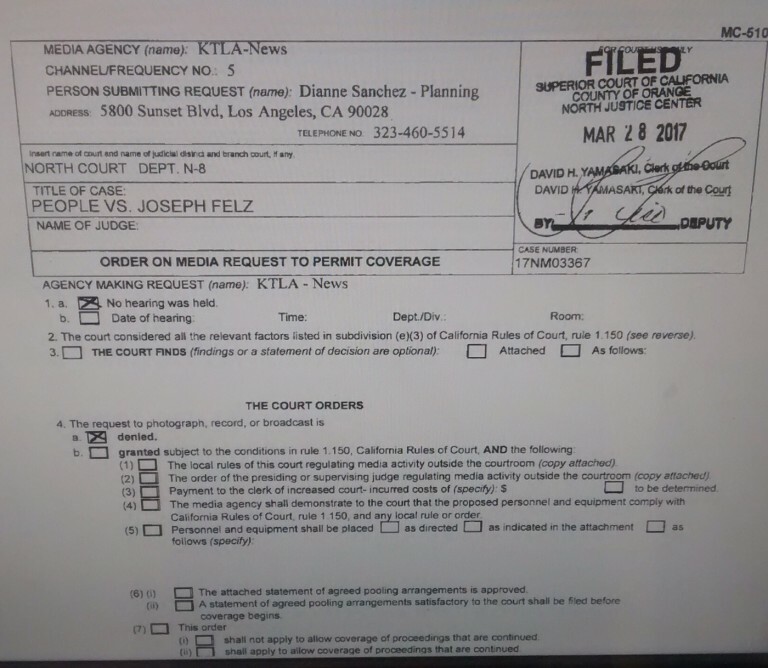 KTLA requested a camera in the court room. Denied. Yet another in a series about the depot elevator additions by our friend, Fullerton Engineer. There is an alarming trend in public works construction, namely the larding up of the project with costly overseers to oversee other overseers. The justification is always the same – hiring essential “expertise” to make sure the project gets done on time and under budget. Forget the irony that no one in charge really cares if a project is late, or how much it costs, although they would prefer that no one find out. But what they really care about care about is the photo-op ground breaking and the bronze plaque with their name on it. The consequences of this trend are two. First, the cost of the project goes up. Way up. And secondly, the overdose of management is guaranteed, when something inevitably goes wrong, to diffuse accountability by the sheer numbers of people potentially responsible for the problem. Exhibit A for the prosecution: the completely unnecessary elevator addition project at the Fullerton train station, a project that has already skyrocketed toward $5,000,000. Yes, you read that right. $5,000,000. In August of 2015 the City employed the services of Anil Verma, a civil engineer and construction manager for vague “construction support services” with a contract worth about $154,000. Since the contract was not provided per our PRA request, we are left to guess what Anil Verma’s scope of work is; we do know they presented two large invoices in 2016 for $55,000, even though nothing had been started except the small ADA remodel adjacent to the AMTRAK office. Regular billing began this spring and the total paid out so far as of April 2017 has been $66,000. As if the professional services of Anil Verma were not enough to oversee this small project, the City hired yet another construction management company in March 2017 – Griffin Structures, for another $154,500. Since the contract was not provided per our PRA request, we are left to guess what Griffin Structure’s scope of work is, but we know that they are not replacing Anil Verma because, as noted above, the latter seems to have begun regular, monthly billings. And finally, let us not forget the amounts that will surely be billed by, and require further contract augmentation for, Hatch Mott McDonald, the original designer of these two elevator structures, for on-site walkabouts. Speaking of inspection, back in June 2015, the City hired the “as-needed” good offices of Smith-Emery, a construction testing/inspection lab. The contract is for just under $50,000, which is an awful lot of money for materials testing on a couple of elevator towers; so we’ll just have to trust our City public works department that the money will be well-spent. Our city council certainly trusts them. 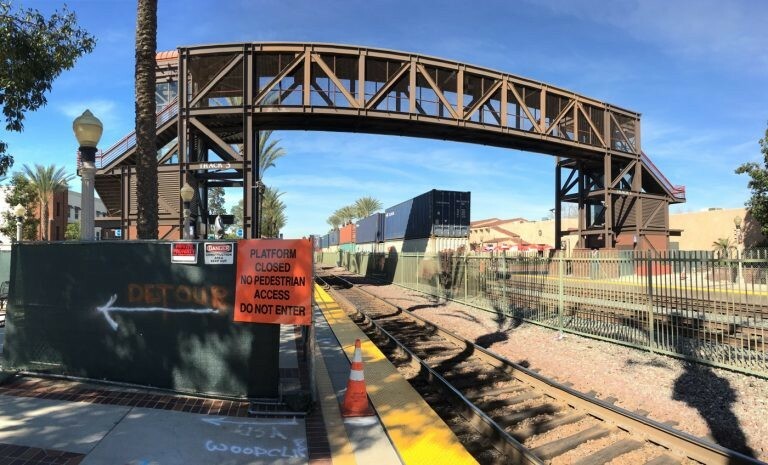 Here is the latest installment in a series by our Friend, Fullerton Engineer, describing the sad story of the ruinously expensive elevator additions at the Fullerton train station. In my previous installments I described a project that nobody outside City Hall wanted or needed, a project that would never have been contemplated without State transportation grant monies, and that had been “designed” under a 2012 contract that had ballooned to a jaw-dropping $460,000 – including a mysterious increase of 28%. The engineer – Hatch Mott McDonald completed their efforts in 2014, per their purchase order billing record. And there the project sat for a year. Why? The answer is not immediately forthcoming and naturally the public wasn’t informed; but the cause of the delay can be reasonably inferred from the staff report accompanying the request to award the construction contract to Woodcliff Corporation in April, 2015. For the first time we read that the OCTA is going to authorize a shift of a million dollars from transportation parking funding – money, presumably, needed to actually build the project. And we may surmise that without the funding, money spent on the engineering/design work, money authorized over three years earlier, would have been wasted. Please observe the complete lack of transparency in the staff report, and the omission of any history that would indicate that staff and the city council in 2011-12 had committed the City to this project without adequate funding. And note that the staff report lazily repeats the casual assertion of increasing train ridership as the justification for the project, but offers no data to substantiate the need. The report does indicate worrisome information. The low bid, by Woodcliff is an alarming 22% over the estimate. But remarkably, this fact does not faze city staff at all, who nevertheless recommend award; nor does it alarm our city council who approved this fiasco unanimously. Staff even admits that there are potential cost savings that could be realized if the project were rebid. But nobody cared. What the public is also not told is that toward the end of the design completion in 2014, a firm called Griffin Structures was given $6000 to provide “constructibility” services, a function that questions the competency of both the designer and the contractor whose job it is to design and build these elevators. Remember the name Griffin Structures. You haven’t seen the last of it. This is the third post in a series by our Friend “Fullerton Engineer” describing the elevator addition project at the Fullerton Depot. So you think the problem with transportation revenue is that there isn’t enough of it? Let’s see what happens when the State of California doles out grant money to localities, in this instance our very own town of Fullerton. California transportation projects are very often driven by the availability of money spent in pursuit of a social agenda. Car pools lanes with fantastically expensive fly-over bridges? Check. Highly subsidized transit for upper middle class commuters? Check. Forget that carpool lanes make everybody’s drive worse and that commuter trains only serve a puny portion of the taxpayers that foot the bill. It’s the gesture that counts, you see, and the more expensive the gesture, the more it counts. Back in 2010, or so, the good folks whose livelihoods depend on putting the plans of our Sacramento social engineers into effect foresaw a big increase in rail transit through the Fullerton train station. But gee, thought someone, won’t that mean making it harder to get all those new travelers to other side of the tracks? The solution? New elevators, and right next to the old ones. Forget the fact that most of the day the existing elevators were unused, or that most people just climbed the stairs; and forget the fact that a sensible set of stairs already existed under the Harbor Boulevard bridge to do the same thing. New elevators made no sense even if the new ridership tsunami was believable: after all – only two trains can stop in the station at the same time, the same as before. But of course the real kicker was the availability of money from our friends in Sacramento to effect alterations in stations that accommodate “transit” modalities, and so the City of Fullerton was going to grab while the grabbing was good, and never mind that the idea was nonsense and that nobody needed or wanted it. On December 20, 2011 our esteemed City Council voted to award a design contract to Hatch Mott MacDonald, an engineering firm to “design” two new elevators right next to the existing ones. The contract amount was $358,390, a remarkable amount given the scope of the task at hand – to replicate the existing bridge in two new, one-stop elevator structures. In case you are wondering, $358,000 equates to the billing of one $100 per hour person working on this project full-time, doing nothing else, for 1.7 years. And so the City embarked on this ridiculous project. HMM began work in march 2012 after the City had signed a master agreement with the State of California. Someone should have become alarmed the following year when Hatch Mott MacDonald’s design service billings eventually ballooned 28% over budget – almost a hundred thousand dollars. But no one did. It was someone else’s money.